There are dozens of ways to share content online. You can opt for written texts, visual content, or audio content. And if you’re thinking about audio content, then you’re probably thinking about starting a Podcast. Podcasting is one of the fastest-growing ways of building influence and gaining authority in any industry. There are about 68 million podcast listeners in America alone, and the number seems to be increasing rapidly. Whether you’re a content creator, an Internet marketer, or a regular person who manages a single web agency, you want to generate more engagement on your site. And if WordPress powers your website, then podcasting is one way to keep your audience coming back to your page. In this article, you’ll discover a step-by-step guide on how to start your first (or next) podcast with WordPress. Also, we’ll unveil the nitty-gritty details of podcasting with WordPress. You will discover the best equipment and WordPress plugins for podcasting with WordPress. Simply put, podcasting is a means of delivering episodic audio messages to your audience. For it to work appropriately, the users have to subscribe to an RSS Feed. After subscription, they will be notified of updates and can also download new episodes when they are released. WordPress users are quite lucky, since the platform is designed with an RSS Feed system. All you’ve got to do is to get the right pieces together and launch your podcast. Next, if you desire to make progress, you’ve got to launch your podcast with the right equipment. Before diving into the various podcasting equipment, you need to know how to pick the right niche for your podcast. Today, there are lots of online marketers and regular folks like you who are making it big with podcasting. Others, however, are just putting out content with no significant traction. Therefore, if you want to make it and overcome the fierce competition you face out there, then you’ve got to pick the right niche — and pick it the right way. The secret ingredient in picking the right niche is narrowing. Narrowing down to the simplest form is vital for individuals who are playing the long-term game and seeking to gain relevance in their industry. For instance, if you’re in the music industry, you need to niche down to a specific era, region, artist, or genre. Yes, there will be “big fish” in the area you choose to pursue, but what will make your visitors keep coming back is uniqueness. Let’s face it; you can’t offer the same thing, the same way as every other person. Therefore, your story, your voice, your unique twists, and your style will make your audience love you and keep coming back. After several weeks, you should notice that you’ve generated a significant increase in signups and subscriptions. Just have little faith, and roll with your gut feeling. Next, you need to actually set up your podcast. By now, you already know that WordPress sites are low-cost to set up and maintain, and if you’re no rookie, you also know that WordPress is the best platform for those who would want to monetize their website and get the most out of it. To get moving, you need a domain name. The domain name is the URL address of your website. For instance, it could be www.businessname.com or www.personalname.com. Web hosting is your online storage space — it’s where all your webs files are stored online. If you’re planning on having a website, web hosting is a must. To get a domain name and a web hosting plan, you’ve got to shell out some cash. But with WordPress, all you’ve got to do is use Bluehost and get a free domain name with some extra goodies. 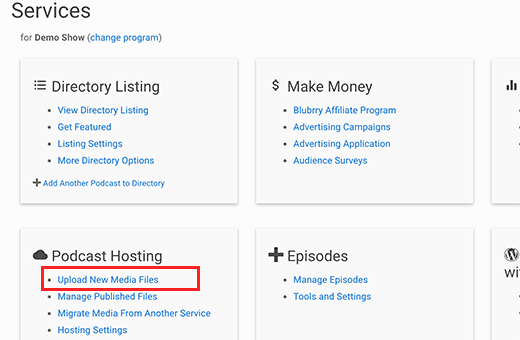 Moving forward, you need to store your podcast files with a reliable media hosting service. Here’s the thing — podcasts are large audio files, and if you store them in your web hosting space, it will take up lots of storage space, which will, in turn, cause your site to slow down and decrease the user experience. When you have a low user experience, you will notice a high bounce rate. Increased bounce rate is not good. One of its setbacks is that your site ranks lower in search engine result pages (SERPs). Therefore, an excellent media hosting service like Blubrry is the way to go. Now your website is set, and you’ve got the right media hosting company, so it’s time to get rolling with the right podcast equipment. There are dozens of tools you could potentially get before you produce a quality podcast for your audience. However, as a beginner, you’ve got to settle for a microphone and figure out the other pieces of the puzzle as you build your podcast business. If you need superior sound quality, then you should go for high-end microphones. Typically, the Samson, Rode podcaster, and the Heil PR-40 are the popular choices among podcast creators. As a rule of thumb, never settle for the built-in mic of your computer, because your audience would be able to identify the terrible sound quality of your computer’s mic. After you’ve got your equipment all ready, it’s time to start creating remarkable content for your audience. There are four crucial steps you need to consider. Content: Who is your audience? And what kind of content do you want to create for them?You need to plan out the first few episodes of your podcast and be prepared to dish out the best value for your audience. Timing: How long would each episode last? It could be 20 minutes, 30 minutes, or over an hour — the choice is yours.However, try and eliminate fluff, as your audience will recognize it. If it has a 30 minute runtime, let it be thirty minutes of insane value — nothing less. There’s no way around this one. Media: Podcasting is not designed to be boring. You need supporting media in the form of background music, intro music, and other kinds of sound effects that make your Podcast session worth it.To retain the attention of your audience, you need to make your sessions dramatic.Sites like YouTube Audio Library, Free Music Archive, and Free Stock Music contain good music.They are all license-free music, so you get all these goodies for free. Scripting: You can either go freestyle or write down a script for your podcast.If you’re creating your podcast in the freestyle mode, you’ll be at the risk of looking unprofessional and giving your audience the impression that you didn’t do your homework.Not good! Is it?However, a good script will help you focus and also enable your audience to get more out of your content. Now you’ve got the taste of what a podcast looks like; it’s time to roll up your sleeves and create your first podcast. To start recording your podcast, you need good recording software. And one of the best recording software today is Audacity. 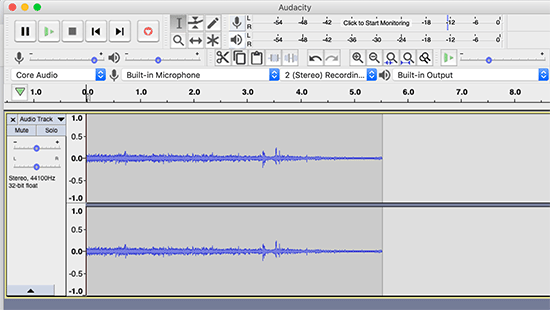 Audacity is an open source and cross-platform software that provides superior podcast recording. With the software, you not only record your podcast, but you’re offered a tool that would help you edit your recordings. What’s more, you get the option of importing background music for your podcast. You can get a detailed guideline on how to use the software. After recording, editing, and saving your podcast on your computer, it’s time to publish it on your website. Remember the Blubrry we mentioned earlier? It’s time to put it to good use. 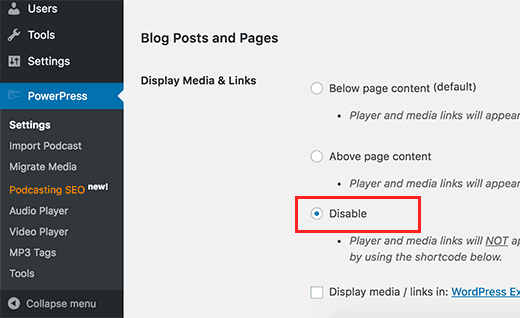 Log into the admin area of your website and install the Blubrry plugin. After installation of the plugin, activate it and follow the prompts to get it running. 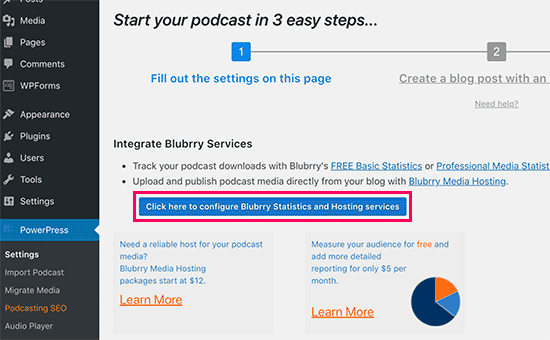 If you’re hosting your podcast files in the Blubrry platform, you have to log into your account, set up your podcast, and fill out the necessary information. Before you hit ‘publish,’ upload your podcast in the Blubbry platform. The process is pretty simple — all you have to do is to navigate through the dashboard and locate the “Upload New Media Files” options. Click on it, and you’re all set. The most reliable way of setting up your podcast is by using the Smart Podcast Player. The Smart Podcast Player provides a beautiful interface where your audience can play, share, and download new episodes of your podcast. Here are easy steps to set up your podcast using Smart Podcast Player. The next step is to head to the “PowerPress” menu and disable the built-in podcast — you don’t need it since you’ve activated the Smart Podcast Player. Navigate to the “Posts” tab, click on “Add New,” go to the “Podcast Episode” section, and upload your file from the Blubrry sever. If you’re not using the Blubrry, you should paste the URL of your media file and verify it. Everything is all set up, and it’s time to get more subscribers with iTunes. First off, download the latest version of iTunes and launch it. 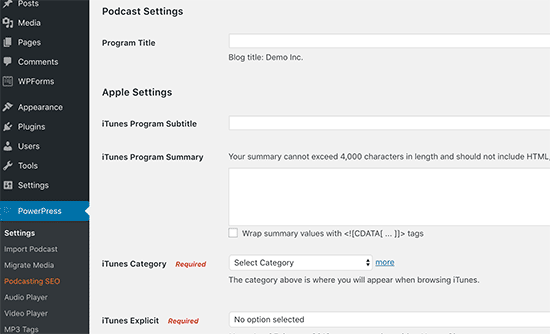 With your Apple ID and the podcast feed URL, log in and submit your podcast on the iTunes platform. Your podcast feed URL should look like this — http://domainname.com/feed/podcast. The domainname.com section should be replaced with the domain name of your website. After submitting your podcast, it would be reviewed by the iTunes review staff, and you’ll be notified when it’s added to the iTunes directory. Notification is usually done with emails. Sponsorship: If you see businesses that could gain from your podcast, reach out to them, and make your pitch. You’d be surprised to see that your little efforts pay off substantially. Affiliate Marketing: We all know the drill — advertise third-party services/products and make some money. However, the products/services should be relevant to your audience. If not, you won’t generate many sales from it. Build an Online Store: If you’re driving enough traffic to your website, then you should build your online store and sell some products from your website. Ask for Donations: Subscribers can support your vision by making a small donation. All you’ve got to do is ask — it’s that simple! If you’re set for it, you should include a payment form where subscribers can make donations. Build a membership site and make your previous episodes available to only members of your site. Creating a podcast with WordPress is quite easy. With a simple tweak, you’re all set up and ready to launch your first (or next) podcast. Also, using WordPress for Podcasting is not difficult — all you’ve got to do is pick a niche, set up your WordPress website, choose the right podcast equipment, have a content strategy, and publish your podcast. What’s more, you’ve got to set up your podcast, upload your podcast into WordPress, get more subscribers with iTunes, and monetize your podcast. What’s your favorite podcasting tool? Let us know in the comments below!